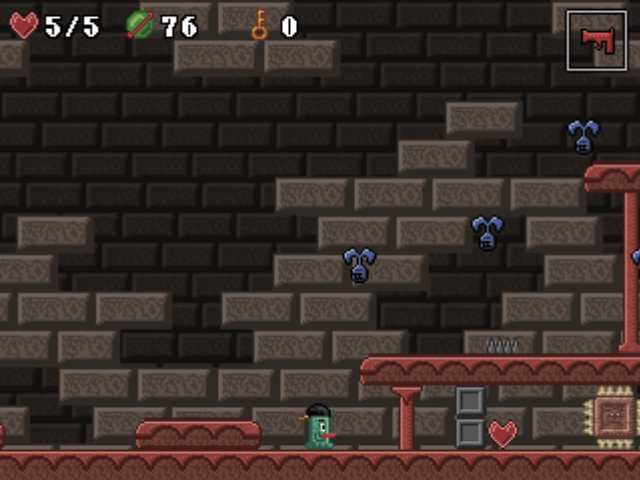 A cute platformer about a creature that wants to leave its home town but isn't allowed to. After locating a weapon and making your way to the sacred temple, the action begins. 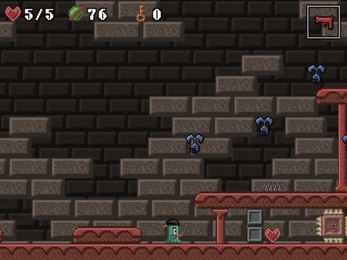 Only 1 level was developed. You live in a village "chosen" by the gods. At least that is what the village priest Alakazoo tells you. Every day, he will come out of his temple and tell the village people "the words of the gods." The character you control and the hero of this story. Looking for adventure in a boring village. She doesn't really like the situation she is in either, but keeps her mouth shut. Plans to take over the world. Many of his evil deeds will be revealed troughout the game. What to think of this guy who is acting all mysterious? Is he an important part of the plot or is he just plain crazy? At least he gives you a weapon, thats cool.